The land of the Venda in the Limpopo Province of South Africa is a beautiful landscape full of history, forests, deep-valleys, waterfalls and lakes shrouded in myth and legend. The Venda resides in the eastern fringes of the Soutpansberg Mountain Range which has been recognised as a centre for botanical endemism in southern Africa and is comprised of a complex network of forest-grassland mosaics. The Venda region itself is a fragmented landscape where human settlement, subsistence agriculture, tea estates and commercial plantations comprised of pine and eucalyptus, mangoes, avocadoes, and macadamia nuts have resulted in localised pressures on woodlands and forests. In an era of global environmental and social change, the Venda possesses a resilient socio-cultural and traditional background of indigenous knowledge particularly, in relation to their botanical environment. I have been awarded a grant from National Research Foundation for Early Career Researchers from the U.K to develop collaborations and research with the University of Venda and other stakeholder groups. I will be working in this region over the next four months where I will be conducting pilot work to explore how indigenous knowledge systems of the Venda are applied in the management and conservation of plants, trees and forests. I hope the pilot work will contribute to understanding local priorities and issues to develop a larger-scale project in this important region. I have been working closely with Mpatheleni Makaulule the founder of the grassroots community-based organisation Dzomo la Mupo whose focus is to revive the role of indigenous knowledge in the protection of forests, rivers and traditional agriculture systems by restoring women’s role in the protection of natural environments and connecting older and young generations in dialogue with one another. We began work in the village of Duthini where we met with the Chief and elders of the Vhutanda Clan to introduce the pilot study. 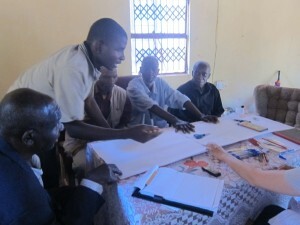 We undertook a mapping activity with the elders of the clan to draw the boundaries of the village, the main landmarks, land use types and asked questions about the history of land use, activities of the land, and gender differences in relation to land tenure and resource management strategies. We discussed the threats facing trees and forests, forest management practices and the future aspirations for their trees and forests. 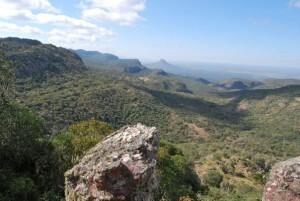 Venda is also home to a number of sacred sites, named Zwifho in the local language such as the Thathe Forest consisting of indigenous Afromontane forest, the natal fig (Ficus natalensis), lemonwood (Calycophyllum candidissimum) and yellowwood trees (Podocarpus latifolius). This sacred forest is protected by the Netshisivhe clan as a place for ancestral worship, rainmaking rituals and traditional ceremonies. We also visited the Vhutanda sacred forests which consisted of small forest fragments within the Thishivhase tea estate protected by a taboo where only members of the Vhutanda clan are allowed to enter. Currently, many of the sacred sites in this region are also threatened by tourism development, large-scale agricultural expansion and commercial plantation. I also undertook guides walks with key knowledge holders of the community concerning the utilisation of plant and tree species in gardens, agriculture and communal land. Identifying local plant species in homestead gardens. 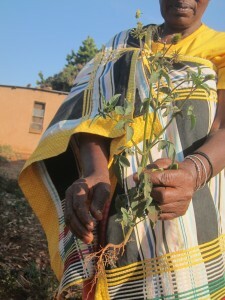 Women named Makhadzis, female leaders of the community, play an important role in storing and sharing indigenous plant seeds among community members for agriculture, making decisions on the species to plant and caring for home gardens. I observed both men and women establishing their own plant nurseries in their homestead gardens having observed particular species declining in the wild and as a strategy for their restoration. Women and men possess an extensive knowledge of the plants and trees in this region and nearly every species has a function for food, drink, medicine, ceremony, firewood, construction, charcoal, trade and shade. 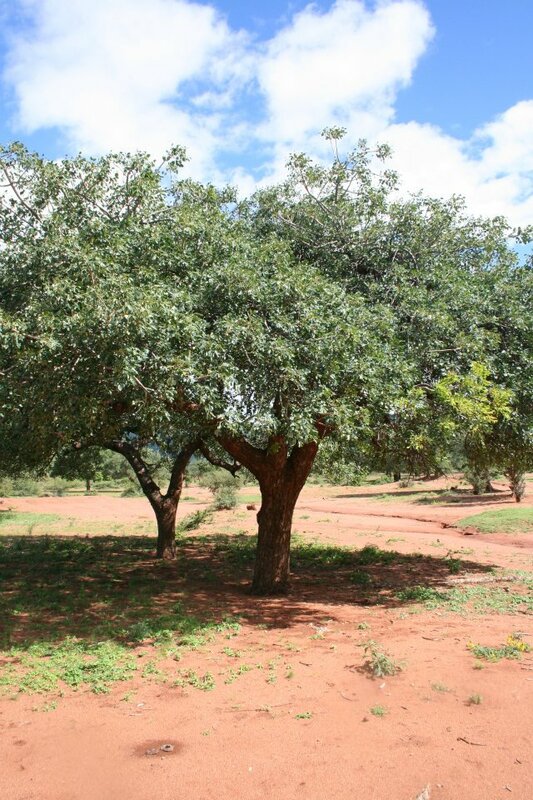 The marula tree (Sclerocarya birrea) named Mufula in Venda is used for its fruits and to make a beer named Mukumbi, while the seed kernals are also used for cooking. The tree is traditionally protected for its importance as a source of food, beverage, medicine and wood. 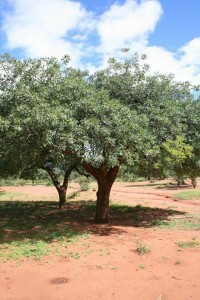 A lichen of the Transvaal Milk Plum (Englerophytum magalismontanum) named Munombelo in Venda plays an important role in connecting with ancestral spirits and Venda spirituality. The mapping activity also allowed for interesting discussions surrounding the concerns of local communities about their land and natural resources. Several community members identified the health of their rivers as a problem where large-scale deforestation from the cutting down of plants and trees for firewood, littering of the rivers and climate change have enhanced the frequency of periodic droughts, negatively impacting water supplies for drinking water and agriculture. Others were also concerned about the level of deforestation on communal land and called for the revival of traditional practices and taboos which prevented the use of particular species for firewood, limits on harvesting species during certain times of the year and prohibitions concerning the harvesting of rare species. Others also emphasised the level of disconnect between younger and older generations in the sharing of indigenous knowledge practices which cultivate respect for the environment, and the lack of cultural and environmental knowledge concerning the importance of different plants and tree species. The discussions highlighted a need for conservation efforts within the human-dominated communal land tenure systems particularly, restoration of the forests and rivers in the region. These early discussions have also highlighted the need for environmental education and establishing dialogue between younger and older generations on issues related to indigenous knowledge systems and the preservation of their natural resources. Over the coming weeks we will continue to work in another five villages within different areas of Venda to gain greater insight into the concerns of local communities in this region.